Here in South Florida, there was no Erika. It fizzled out completely, as far as I'm concerned. We had more rain storms in the two weeks preceding than during this so-called 'tropical depression'. I was hoping for at least enough wind to clear out the jungle overgrowth in our backyard. As per The National Hurricane Center, Erika has dissipated and a special advisory was issued also discontinuing the watches and warning for the islands. Aug 29, 2015 · Tropical Storm Erika dissipated Saturday morning as it pushed over Hispaniola and Cuba. Aug 29, 2015 · Tropical Storm Erika heads to Hispaniola with its heavy rains after leaving at least 20 people dead on the Caribbean island of Dominica. 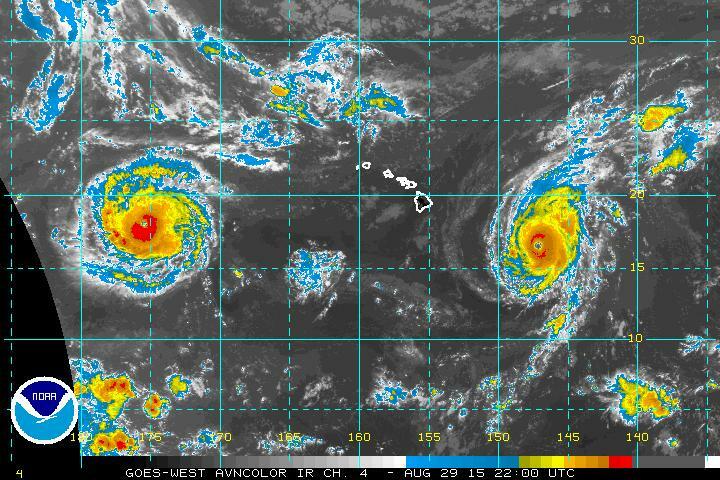 See news following these articles about THREE hurricanes in the Pacific at the same time. Unprecedented! Erika is already causing heavy rainfall and increasing gusty winds in western Cuba and South Florida. Blogger note: I have not seen much wind here south of Miami.. just a lot of rain. While Erika has weakened to a tropical rainstorm, Florida will still become the target of potentially flooding downpours this week. Erika lost its battle with the mountainous islands of the northern Caribbean and strong wind shear on Saturday morning. The concern for Erika to strengthen into a hurricane was greater when it appeared that the system would track north of the Caribbean Islands to the Bahamas and Florida. However, Erika maintained a more westward track and was shredded apart by the mountains of Hispaniola. The once-tropical storm is now a tropical rainstorm and is only trackable via a surge of tropical moisture from the Caribbean to Florida and the eastern Gulf of Mexico. AccuWeather meteorologists will be closely monitoring the remains of Erika for any potential for it to reorganize over the eastern Gulf of Mexico during the first part of this week, although it seems unlikely at this point due to Erika's disorganized state. Flooding downpours will continue to spread from Cuba to Florida, grazing the Bahamas in the process. In addition to flash flooding, mudslides are a serious concern in the mountains of Cuba. Due to Erika weakening, widespread damaging winds are not expected to accompany the downpours. Isolated wind gusts may still accompany showers and storms as they move across Florida and a quick spin-up of a tornado or waterspout is not out of the question either. When the Next Hurricane Katrina Hits, Is the US Ready? Widespread rain totals of 2 to 4 inches can be expected with localized amounts of up to 8 inches. Note at left, the Solar X Rays M-Class Flare is now downgraded to "Active", but the Geomagnetic - Storm has been Red all during this time! The mushy yet cantankerous system, which kept South Florida on edge for the past week, dissipated into an open wave on Saturday morning while in the Caribbean, near Cuba. Thank strong wind shear and the system’s collision with the rugged mountains of Hispaniola. “Well, we made it through the hurricane scare and can chalk it all up to a really good test run,” said Tara Monks, spokeswoman for the Port of Palm Beach. It’s possible Erika will make a comeback. The National Hurricane Center gave Erika's remnants a medium chance of regenerating in the Gulf of Mexico next week. If so, it’s expected to aim toward Florida’s west coast or panhandle. At this point, we here in South Florida believe it will be a tremendous soaking rain with danger of flooding. We need to keep monitoring this, though, as we have seen many changes in this storm and others before this. While Erika has weakened to a tropical rainstorm, Florida will still become the target of potentially flooding downpours during the final days of August and start of September. AccuWeather meteorologists will be closely monitoring the remains of Erika for any potential for it to reorganize over the eastern Gulf of Mexico during the first part of next week. The warm waters of the eastern Gulf of Mexico and less wind shear could support re-development, but this would not happen quickly due to Erika's current state. 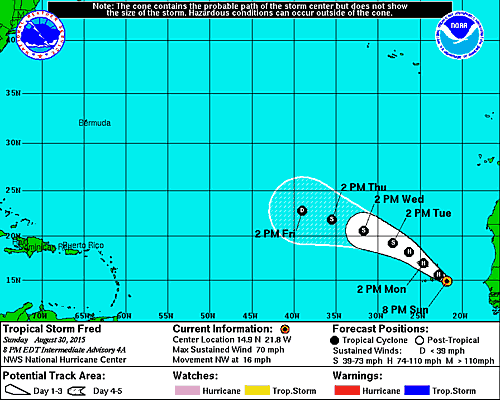 The potential for any reorganization will end at midweek when the remains of Erika push inland. My daughter's, my sons, my grandsons and their families here, and in the Florida Keys, my sisters, brothers, nieces in Key West, Jacksonville and east coast, Florida, aunt and cousins in Tampa and - my own house and friends in Cutler Bay, Florida are in the flooding zone. Maybe son and family in Mississippi and grandson in Georgia just north of Jacksonville, Florida. After Erika brings heavy rain and locally gusty winds from Hispaniola eastern Cuba into Friday night, the system will move toward the Bahamas, the Keys and South Florida this weekend. Erika remains a tropical storm spinning about 95 miles southwest of Santo Domingo in the Dominican Republic, as of 5 p.m. EDT Friday. Maximum sustained winds were 50 mph (80 kph). Erika will track across Haiti Friday night. According to AccuWeather Hurricane Expert Dan Kottlowski, Erika is a very disjointed tropical system at this time and is likely to weaken to a tropical depression as it crosses Hispaniola and part of Cuba Friday night into Saturday. "If the center of Erika survives the mountainous terrain of Hispaniola and part of the land mass of Cuba, it should slowly reorganize back into a tropical storm this weekend as it drifts over open waters once again," Kottlowski said. "If Erica does not survive the interaction with Hispaniola and Cuba, it may never reorganize into a coherent tropical storm again and impact on Florida would be reduced." With luck the winds will remove all the overgrown jungle vines in our yard and house. Yesterday, our giant producing papaya tree broke, so we don't have to worry about it! 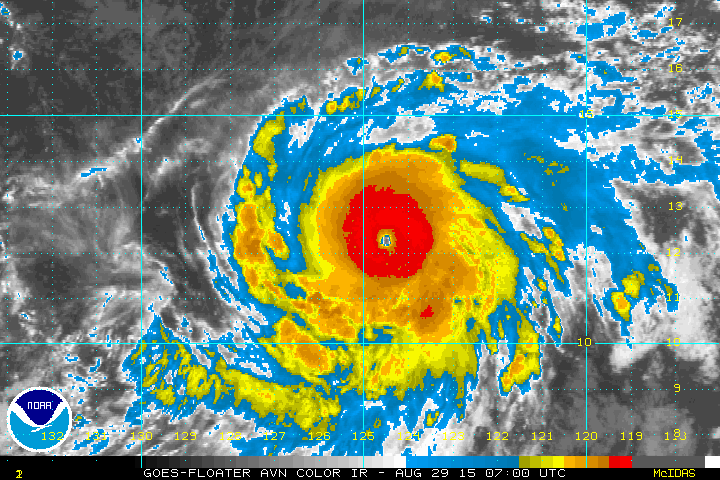 Two major hurricanes (Kilo and Ignacio) in the Central Pacific (140-180W) for the first time on record.